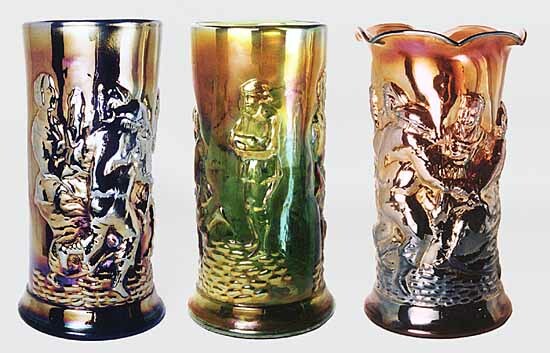 I wrote this article at the request of the International Carnival Glass Association and have been asked to share it with the Millersburg Club members. 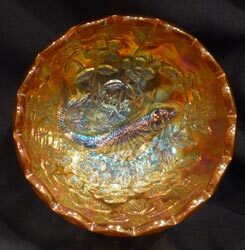 “Top Ten” list of Millersburg Glass pieces. My first thought was that surely this wouldn’t be too difficult to accomplish. But when I actually sat down to do the list I ran into some issues. The first issue I had was that if I only list ten pieces of Millersburg there will be way too many qualified pieces and not enough numbers between one and ten. Therefore I have taken the liberty to group some pieces together. This way I won’t have to list all eight People’s Vases in the top ten with room for only two other pieces. The second issue I ran into was; if I rate this certain piece higher than that other piece, what will this person think or will I have offended that other person. I was able to get over that issue by telling myself that hey, this is MY top ten list. It doesn’t mean everyone has to agree with my list. I am sure that many will not completely agree with the order of the pieces. And also, this list is compiled from memory of pieces I have seen in the past. I am sure there are pieces that I have not seen that would be very qualified to be included. If you have a piece that should be on the list please do not send me any hate mail or complain to the committee. You are very welcome though to send me an email or call me, I would love to hear about it and then also, I will tell the editor that you have just volunteered to do a “corrected” list for the next issue. Actually, I do welcome any ideas or corrections. The comments on the items are mainly from my memory and sometimes my memory gets me in trouble. I there are statements or comments made that are not true or incomplete, I would appreciate if it was brought to my attention. I have a really good memory. The only problems sometimes it is very short. 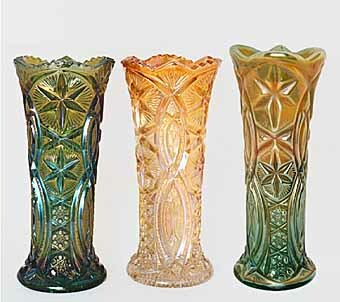 These peculiar pieces of glass show the ingenuity and ideas of John Fenton and his craftsmen. There are only a handful or so known in the Amethyst, Green and Marigold. There are a few collectors that have been able to acquire all three colors. Bo and Randy Jones provided a picture of Doug and Karen Engel’s trio and report that Don Clark now owns two of the three colors. Of course all Millersburg plates are considered rare. The top plates in Millersburg are the 10” Chop Plates. In the Peacock Pattern there are 2 known in Amethyst and 5 or 6 in Marigold. In Blackberry Wreath there are also 2 known in Amethyst and also some in Marigold. Chop Plates are also known in the Hanging Cherry pattern. There is one Marigold Many Starts Chop Plate. Also worth mentioning is the plate with no interior pattern but has the Tre-Foil Fine Cut exterior pattern in Marigold. Two Big Thistle Punch Bowls are known to exist. Both are Amethyst with beautiful iridescence, especially on the exterior of the bow and base. One has a flared out top and the other’s sides are straight up. There are four Blue Multi Fruits & Flowers Punch Bowls. There are several beautiful pieces in the Big Fish pattern. An Amethyst Oval Banana Boat that resides in North Carolina. Several Tri-cornered pieces: including one in Vaseline and a beautiful Green one. These seem to have exceptional radium iridescence and are outstanding pieces to have on display. There are two of these vases known. These two pieces are the only pieces in all of Millersburg with this color treatment. Were they experimental pieces? Was there a mishap in that batch of glass? These vases are great conversational pieces and always get a lot of attention when they are displayed. 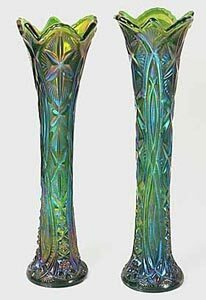 These 15” tall vases all have exceptional radium iridescence. There are several known in Green and Amethyst. A Marigold one was recently discovered and has found a home with Laurie and I. We have been fortunate to have been able to acquire an Amethyst and a Green one recently and they display nicely together. There are several beautiful whimsy’s known in the Peacock pattern. On the top of this list is the Amethyst Spittoon that is in the collection of Carroll and Tia Cook from Texas. Joe Weaver has a Marigold one and both have exceptionally beautiful iridescence. 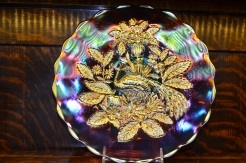 Some other peacock pieces are oval bowls in Amethyst and Vaseline, a Tri-cornered bowl in Amethyst and also a Marigold Rose Bowl. It seems these pieces are some of the most beautiful pieces in all of Millersburg Glass. All of these whimsy’s originated from the Hobstar & Feather Rosebowl. 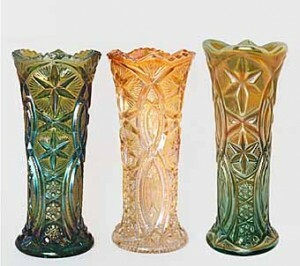 There are three of the pulled vases known; one in Green and two in Amethyst. There is also a spittoon shaped piece and several with the ruffled top. These pieces are some of the heaviest pieces of carnival glass and weigh in at five pounds. I will also include in this list Emerald Green Rosebowl that sold at the Millersburg Antique Festival auction in 2012. 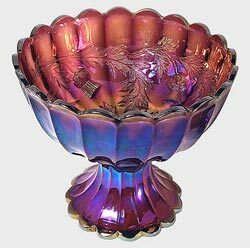 This Rosebowl has absolutely beautiful Blue iridescence and resides in Oregon at the home of Doug and Karen Engel. 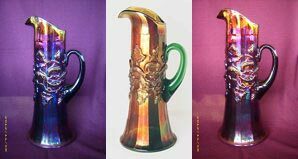 One of the most desirable pitchers in all of Carnival Glass; there are two know in Green and 4 or 5 in Amethyst and Marigold. As far as I know there is no collector that has been able to accumulate all three colors at the same time. These pitchers rarely change ownership and it is an honor to own one of the Green ones. I want to thank Bill & Carol Richards for letting me take care of the one that was sitting in their home for 25 years. It is the “star” of my collection. A Marigold one sold at the 2012 Millersburg Antique Festival Auction. Perhaps these vases are the most sought after and desirable pieces in all of Carnival Glass. It is generally agreed that they are not the prettiest pieces of glass, but what they lack in beauty is more than made up for in desirability and recognition. To be able to own one of these vases is a dream of most collectors. There are a total of eight Peoples Vases known. There is one each in Blue, Green and Marigold. The rest are Amethyst. The Blue one sold at auction in 2006 for $100,000.00 and to my knowledge is still the only piece of Carnival Glass to sell at auction for a six digit amount. Please accept the above list as merely a suggestion. Again, I am sure many would disagree with me and would include other pieces that I have totally omitted. Or some would put the listed pieces in a different order. There are several pieces that were on my original list and had to be removed due to space limitation. I feel I should list some of these and maybe we could put them in the “Honorable Mention: category. Below are some of those in no particular order. I am sure there are others that I either don’t know about or have missed. Gay Nineties Pitchers, Mitered Oval Vases, Butterfly & Corn Vases, Vaseline Feather & Heart Pitcher, Trout & Fly Plates, Olympic Compote, Fleur-De-Lis Compote, Diamonds Punch Bowls. Now the fine print: This is not to be used as a value guide. The order of the list is strictly the opinion of the author and is subject to change without notice. Any attempts to acquire a piece from each level of the list could result in serous financial hardships. This should only be attempted by professionals. I f you fee you have a carnival glass addiction problem please contact professional help; such as the editors of this newsletter etc. What is your Top-Ten List? Email your top-ten list to millersburglass@hotmail.com.